Hello everyone. 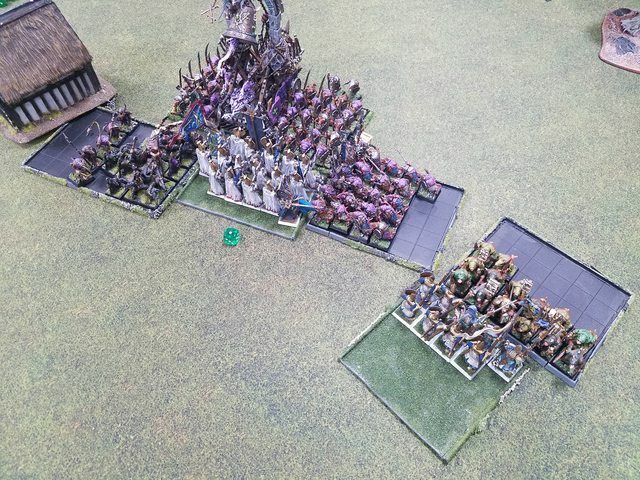 Back with another battle report, my first game since moving to the UK! Hopefully there will be many more coming. Picture quality isn't too great, apologies for that, need to spend more time taking them. 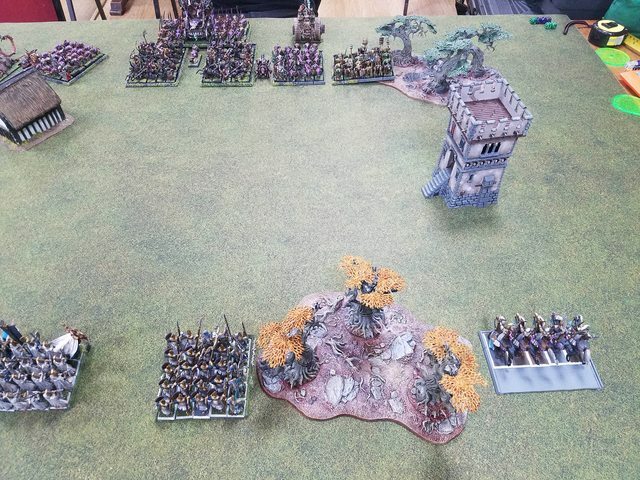 High Elves dropped first in a standard Battle Line game. I put Ellyrian Reavers on the far right flank as my throw-away chaff deployment figuring they can redeploy to wherever they need to once the fight commences. I then put my Dragon Princes on the far left flank to try and sweep the side with the Dragon Mage behind a building nearby. The center is held by my Phoenix Guard will all three characters and on each side of the Phoenix Guard are some Spearmen with a woods anchoring the right flank. The skaven drop both slave blocks dead in the center with the Bell unit right behind them. The Monks are on the Skaven left with the catapult behind it and the gap between the monks and the slaves is filled with one of the clanrat units with the level 2 embedded. The BSB is with the Bell. On the Skaven right is the other clanrat block with the other engineer, and their far right has the two rat-darts and the Abom. 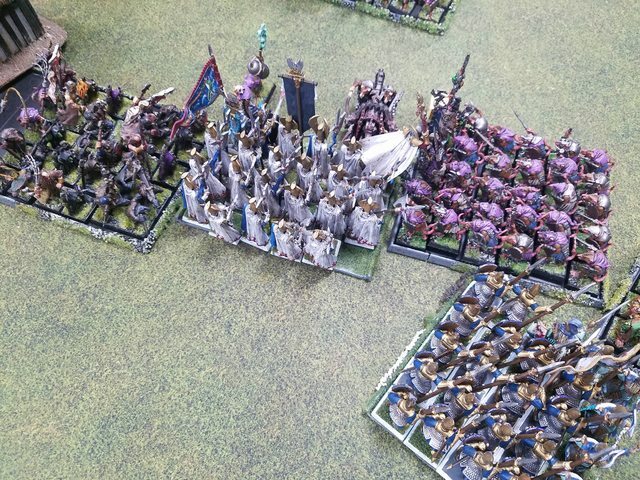 High Elves get first turn. My beginning plan is to advance my infantry obliquely up the center holding back the right flank a bit. The Reavers will dash behind the enemy line to kill the catapult. As my infantry blocks engage the enemy infantry blocks pinning them in place, the Caledorians will sweep the left flank and circle behind the engaged enemy infantry and be the hammer to my infantry's anvil. The plan's primary weaknesses are twofold. Firstly, if the Skaven magic and shooting takes a toll on my infantry they may not last long enough for the Caledorians to arrive and save the day, secondly, if the Caledorians are delayed too long by the Hellpit then my center will stagnate and die through force of numbers. Both risks were, in my opinion, acceptable, though. I follow my plan to the letter. The infantry in the center advances relatively quickly with the right flank holding back. The Reavers use their vanguard and march moves to get completely behind the Skaven front line and in range of the Plagueclaw. The Dragon Princes move forwards almost full speed and the Dragon Mage takes up station beside them. If the Hellpit goes for them it would need a 17-18" move, which I figured was unlikely, allowing me to counter-charge. If the Hellpit went for the infantry's flank it would be in the same position, needing an 18" move the reach them and in that case leaving its flank open to my Princes. 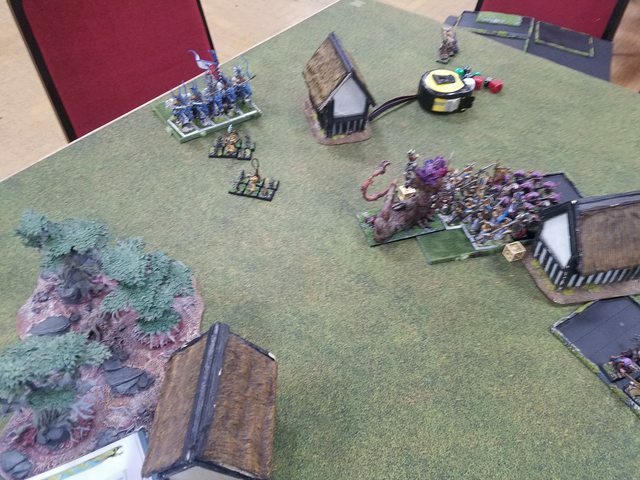 Magic sees Soul Quench miscast on 3 dice, killing 5 Skavenslaves and wounding my Dragon Mage along with draining the rest of my dice. Great start boys. The Reavers wounded the Plagueclaw with some sharpshooting. The whole field advances, wheeling to face my line. The rat darts move forward to cause movement issues for the Dragon Princes, but then the Hellpit rolls a 14" move and blasts right past the rat dart screen. 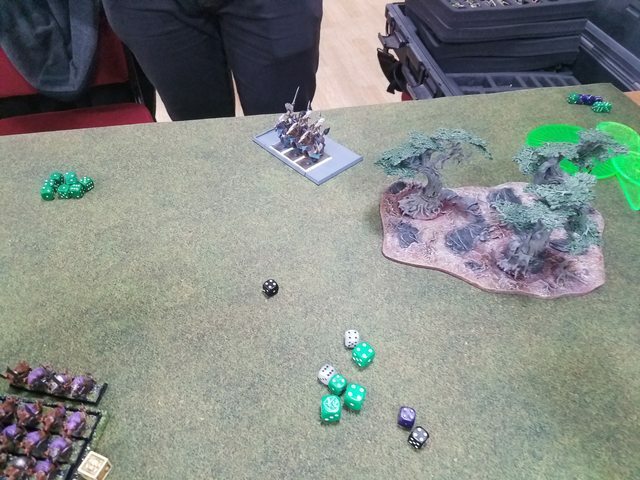 Magic sees a big Skaven phase with 10 dice, and the first of 3 successful condenser rolls. Scorch goes onto the larger Spearmen block, miscasts, and burns 10 of them. The miscast wounds both engineers and the Grey Seer, though, and costs the Skaven 5 dice. Skitterleap is summarily dispelled. The Plagueclaw tries to splatter some Dragon Princes but misses with a 10" scatter. Charges! Charges everywhere! 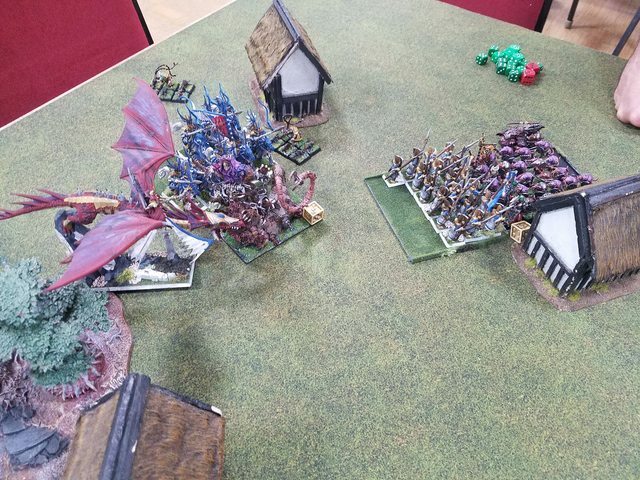 The Dragon Princes hit the Abom in the flank, the Dragon Mage hits it to the front. The Phoenix Guard charge the center Slave block and the weakened Spearmen charge the far right Clanrat unit. The Reavers attempt to charge the Catapult but come up short. The final Spearmen block moves up to cover the flank of the Phoenix Guard a bit. Magic is useless as a weak phase sees Flaming Sword dispelled and no other spells to cast. The Spearmen kill 3 clanrats on the flank and lose 1 elf. The Phoenix Guard cut down 15 slaves in a brilliant display of martial prowess losing none in return. This breaks the Slaves' steadfast and they promptly explode. The explosion gets one Guard, while they overrun into an inconveniently located Warpfire Thrower. In the critical title match, the Dragon Princes and Dragon Mage roll 12 wounds to the Abom! And then 9 are saved with regen. The Dragon then unleashes it's breath weapon! For 2 dice. And no wounds. Two Dragon Princes are then squished under an Avalanche of Flesh and the High Elf plan is suddenly in serious danger. Counter charges! Counter charges everywhere! A Doomflayer charges into the Phoenix Guard and another one goes into the Spearmen on the Skaven right. 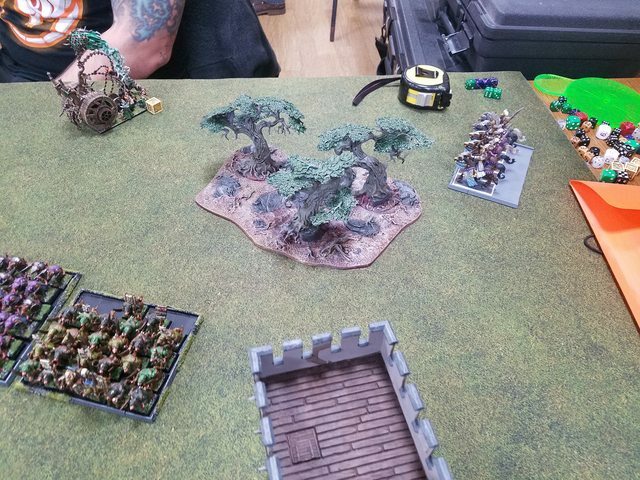 The second slave block hits the Phoenix Guard in their left flank and the second block of clanrats hits the Guard in their right flank, while the Plague Monks hit the Spearmen to the front. These charges were all possible due to that very very inconveniently placed Warpfire Thrower holding up the Phoenix Guard advance. Magic sees Wither scrolled as it goes onto the Phoenix Guard while Blessed with Filth on the Clanrats is dispelled along with Scorch. The Plagueclaw kills two Reavers as that is the only eligible target. The Spearmen on the Skaven right kill the Doomflayer and drop 6 more clanrats at the cost of 2 elves. The Monks kill a further 2 elves, but lose 2 bodies in return. The Guard kill both weapon teams, 3 slaves to their left, and 1 clanrat to the right, but lose 1 Guard. More dangerously the Archmage takes 2 wounds from targeted attacks. And then disaster strikes. The Caledorians fail to do any damage to the Abom and lose 3 more princes to a further Avalanche of Flesh along with a wound to the Dragon. Not to worry, though, as I can make their leadership tests surely. The Dragon Princes break. Then the Dragon Mage breaks. Hmm. I'd like to say I made brilliant maneuvers to recover the damage, but alas most of my army was either running or engaged in combat. So the Reavers charged the Catapult, and then the Dragon Princes rallied. But not the Mage, the coward. My Archmage heals himself up to full with Apotheosis and brings the Phoenix Guard up to the indomitable 3+ Ward save. 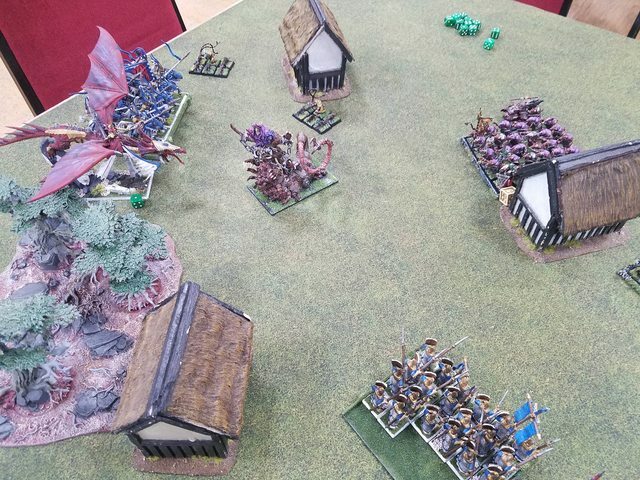 The Hellpit turns and crashes into the back of the Spearmen on the Skaven right, while the rat darts move to block the Dragon Princes from playing a further roll in the game. The Screaming Bell also charges into the front of the Phoenix Guard now that the pesky weapons teams are out of the way. Scorch goes off on the Guard but kills none thanks to the glorious 3++ that they still have. Death Frenzy miscasts on the Screaming Bell unit and 5 clanrats are killed by the explosion. The Spearmen on the Skaven right valiantly kill 3 Clanrats and the Engineer, but 9 are killed by the Abom's attacks and the unit breaks and is run down. The other Spearmen kill 2 Monks and lose 5 in a rapidly shifting battle. 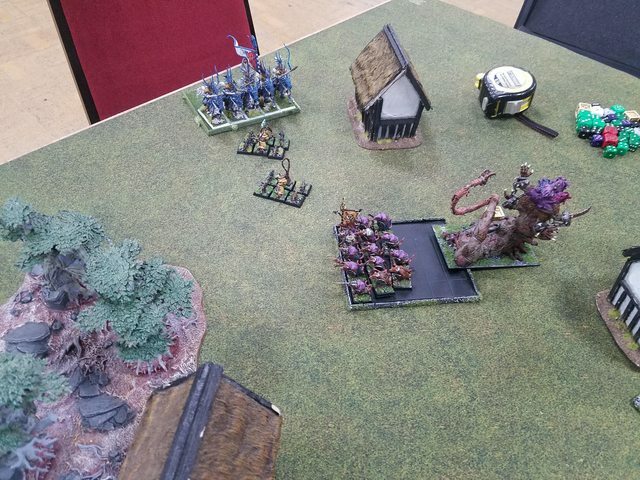 The Phoenix Guard prove that they are the stuff of legend, however, as they kill 2 Slaves and 3 Clanrats at the loss of 2 elves, while the BSB cuts the head off of the Grey Seer in revenge for the Archmage. They win combat through sheer epicness, but the Skaven don't go anywhere. The Dragon Mage rallies and the Dragon Princes charge a Rat Dart. Piercing Bolt kills 4 rats. The Dragon Princes wipe out the Dart and overrun into the next one. The Spearmen again lose 5 bodies to the Monks, but kill 3 in revenge. The Phoenix Guard continues to shine killing off 10 rats of various units at the loss of 1 elf. The Bell casts Scorch which is dispelled, but then the Engineer casts Scorch killing 3 Phoenix Guards. The Spearmen then turn combat around a bit killing 3 more Monks at the loss of 1 elf. The Guard kill off a further 10 rats but lose a dreadful 4 elves. They win combat, though, and the Slaves blow up killing 1 rat and 1 Guard. The Princes kill off the second dart. As it is getting very late and the game is obviously nearly over the Dragon Princes stay put and the Dragon Mage shifts position slightly to try to get the Phoenix Guard with Flaming Sword. 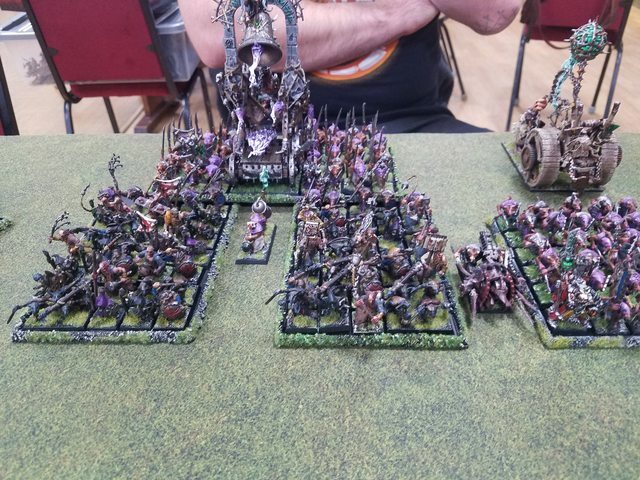 This is dispelled, but he then decides to cast Piercing Bolts onto the remnants of the Skaven right clanrat unit to try and get some cheap VPs. He promptly miscasts and kills himself, for a measly 3 rats that then don't flee. The Spearmen lose 1 elf and don't kill any Monks, but hold. Then the Phoenix Guard goes. They kill 6 rats and wound the bell, but Asuryan removed his favor and a further 4 were cut down. They then broke from combat and were run down ignominiously. The game is called as a resounding Skaven victory. That went very badly, though it was a fantastically fun game to play. The turning point of the game and definitely my massive tactical mistake came on Turn 2. I charged essentially my entire army into combat that turn, which at the time seemed like a decent idea. I was very concerned about the attrition my units would take while exposed to the Catapult and Scorch, and wanted them out of that quickly (I didn't realize Scorch could be cast into combat, whoops). I figured that all of my units could hold on in combat for a decent length of time and that they would last longer in combat than under the template of a Plagueclaw or repeated Scorches, and to some extent I was right. My units did last a good length of time in combat and once I got close in the Catapult was useless and my opponent didn't want to cast Plague for fear of it annihilating his own units (his next magic phase would have seen ~22 Phoenix Guard and characters test along with more than 60 rats). Lasting through combat, of course, isn't enough, though, you need to win them, and I thought that would be possible by the arrival of the Caledorians. With all of my infantry locking down all of the Skaven infantry the Caledorians could have roamed free and simply rolled up the Skaven flank. This all relied on the Caledorians killing the Abom, though. I thought I had been handed a blessing by the Abom running so far forwards accidentally, but I still failed to kill it. Some of that was down to dice rolls, (passing 9 of 12 regens and rolling a 2 for the breath weapon), but I also failed to go for the 6-dice intentional miscast of Flaming Sword to ensure the Abom died (I think I rolled 4-5 dice). Furthermore, once the Abom lived there was nothing I could do to solve the situation since I had charged all my units into combat. My plan to pin the Skaven into place and give myself operational freedom instead resulted in the Skaven getting operational freedom with the Abom to crush my Spears on the Skaven right, and then even though Phoenix Guard are incredibly tough, 100 rats + a Bell + an Engineer + a BSB + Scorch of course would eventually win. I should have held back on Turn 2 until I knew the Abom was dead, and during that time I could have also used my awesome magic, like Fiery Convocation, to burn up probably more rats than I killed through combat that turn. The game was still great fun, though, and I look forward to a rematch! As a side note, immediately following the battle all surviving Caledorians were summarily executed as cowards and traitors. Thanks for this CR, very enjoyable! I think you had the stronger list. The 3++ PG are formidable. The support units are a little fragile but they have some killing power. My concern is the lack of shooting. Sure, you're not going to target those endless blocks but you do want to weaken his Rares. The Skaven list is a wall of Infantry. No Dispel Scroll is risky and I'd have had Storm Banner in, if only to lock your Dragon Mage down for a turn. I don't rate the Plagueclaw, a couple of the other Rares would have carried more threat. I'd have taken Fireball on the DM (Abom) and maybe Drain Magic instead of Unforging because you want two shots at Augments when you're locked in combat (for that 3+ Ward). Dreaded 13th is a spell the Skaven want almost every game but especially here, where it's by far their best answer to the PG. In general I think you deployed better. I'd have had the PG leftmost of your blocks though, to avoid what happened to them in the game and hopefully link up with the fast attack units. Aboms are really random, so ideally you want to shoot wounds off them before engaging. The combat seemed a bit unlucky but again, Eternal Flame on the DP's is a good all-comers pick and would have helped you here. 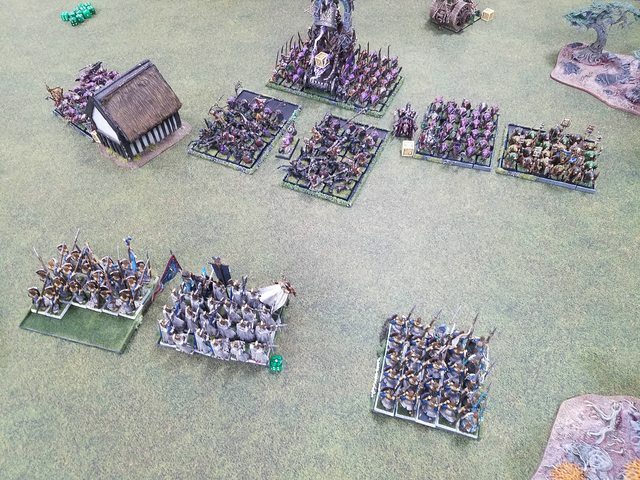 Charging the Spears away from the PG and exposing their flank seemed unhelpful. It was only because the Skaven could throw everything at them that they finally went down. Credit to your opponent for getting all those rats in your face quickly though. You did seem unlucky with the mages, though yes, sometimes 6 dice are definitely called for! The lack of shooting is a weakness I'm aware of, I'm working on adding some archers and Sisters of Avelorn to my army but they are still a ways out. My opponent said he was waffling 50/50 about the Storm Banner and only just decided not to take it. We didn't know each others lists beforehand, so he didn't know I'd have a dragon. Not taking Fireball on the Dragon Mage was purely down to inexperience with Skaven, I thought the Abom was T6 so I didn't like the odds of Fireball hurting it. Drain Magic also would have been better, yes, I had a disconnect between what spells my mage had and where he would be. For the Dreaded 13th my opponent isn't a fan of it since it's so extremely powerful, so he doesn't like to play it. I'm the same way with the BotWD. Yeah, putting the Phoenix Guard on the flank would have allowed me to better respond to the Abom and to avoid getting encircled so quickly, but my concern with that was that if my entire right flank was only Spearmen I wasn't sure if they could hold as long as they needed to, so I had the Guard placed more centrally to stiffen the flank. Banner of Eternal flame on the Dragon Princes would have definitely changed the game. I've always wondered when it would be very useful since I've never really faced much regeneration in my battles facing Chaos/Empire/Vampires so that Banner always seemed like an odd choice but now I definitely see the value. Charging the Spears away was a risky decision. I figured eventually that Clanrat block would come around and either charge the Dragon Princes locking them down for the rest of the game or get to the rear of the Phoneix Guard causing more issues. I was banking on the Phoneix Guard making it slightly farther before hitting the warpfire thrower, the Slaves were in arc by less than half an inch to flank charge the Guard, I was hoping they'd get past and then the slaves would be delayed for long enough getting into combat for the Guard to break the other clanrat block. 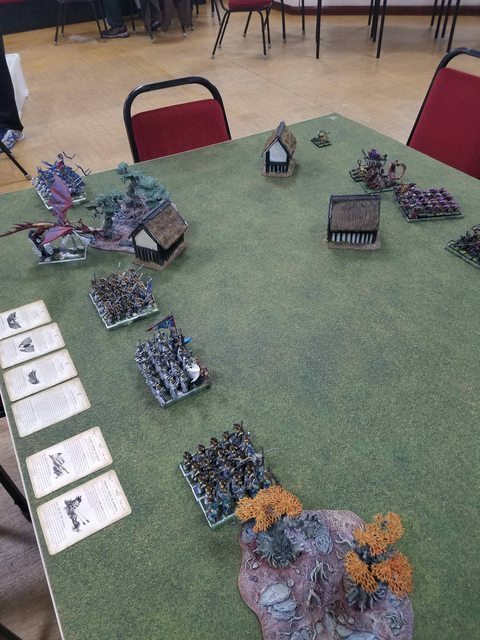 I've got another game against Skaven coming up soon, but I'll be bringing Lizards next time! Hopefully it will go better! For the Dreaded 13th my opponent isn't a fan of it since it's so extremely powerful, so he doesn't like to play it. I'm the same way with the BotWD. I get this but things like the 3++ unit are why 13th is in the game. With the 25+ to cast and your dispel scroll he'll probably only get it off once anyway. A big unit of Silver Helms with characters and World Dragon might be a bit of a nightmare for Skaven but that banner wouldn't add a huge amount to your list. Maybe if you had Swordmasters or Lions but again, 13th is a counter then. That banner just seems a good fit there. It's rarely a problem and sometimes it's really useful.Trolls, Crypt Horrors and Beasts of Nurgle for example are good picks and Flaming Attacks are brilliant against them. Yeah, hard to predict these things sometimes. Very interesting, what kind of list will you bring? Thanks for the battle report. It was a fun read. You were a bit unlucky with the charge on the Abomb. I agree with the assessment that the banner of eternal flame would have probably won you the game here. Or at least, make things go your way from the start. A few other things I noticed. I agree with SA that taking the fireball would have been a better choice for the dragon mage. It almost always is I think. The only other spells I would consider keeping are fire-cloak and perhaps flame cage. But fire-cloak only if I would go more offensive with the dragon mage (so bring the star lance instead of a scroll) and flame cage against something like skaven if I need the board controle. But the strength of fireball is that it's a very versatile magic missile. Low casting cost of D6 hits. You can basically one dice it with the +4 from the DM at the end of your phase. But you can also go to town for 3D6 hits. Which is actually still in range of a DM on 4 or 5 dice. I think you were too aggressive with your list. Especially with the infantry part. Spearmen can go toe to toe with most skaven infantry and he had no answer to your Phoenix Guard. They stuck in combat 6 rounds while taking very little losses. But By being this aggressive you let your units be swarmed by the skaven, which let your army get taken apart piece by piece. If you had kept back a bit and focused on one flank (probably your left) then you could have dealt with only half his army first, before needing to engage the other flank. Also, I understand the dragon mage charging into the Abomb (I would have done the same I think), but it's not really the sort of target you want it to fight. The dragon and mage are a bit too low S and number of attacks to be effective against monsters I think. Still, you had a good chance of getting rid of the abomb with a bit better dice. As a side note, I don't think the sword of battle adds much to the dragon mage. 1 more S3 attack isn't going to do much. I think it's a waste on any HE character, unless perhaps you're counting on the lore of beasts to kick in. On the army list, I don't think the prince on foot is a good choice. He brings 4 S6 attacks to the table and costs something like 230 points, is T3, 4+ armour save, 4+ ward and 3 wounds. For 230 points you could also bring 15 white lions with FC, which give you 16 S6 attacks (not ASF, but still I5), with 15 wounds. Which is a much better deal in my opinion. It would be different if the prince was mounted with the DP's. This would let you increase his armour save to 2+ and lets you bring the giant blade for S7 if you drop the ward 1 point. The same goes in part for the BSB. Though he's necessary to have and since you want him central I can imagine you bring him on foot. But in your list I would simply not bring a prince. 12 more S6 attacks would have made a huge difference against the wall of skaven. The same with having another unit on the table, which would have given you more board control and ways to pressure your opponent. And LD10 vs LD9 isn't that big of a deal. Yeah, the 3++ unit is exceedingly tough, and if my opponent had had the 13th it could have been a very different game. Having the BotWD wouldn't have done much for this particular list and for what happened in this battle, but I don't include it in any of my lists because I've seen too many battle reports where the battle is won by the Banner being on a unit and then that unit carving its way across the battlefield. It's just not something I'm personally a fan of. I agree, yes, and will most likely go Fireball when I next field a Dragon Mage. My thought had been that Piercing Bolts could get me more hits on the Skaven blocks than Fireball at a much lower casting value, but the weakness of that was of course that Piercing Bolts has no use against things like Aboms or Doomwheels. I definitely agree. Holding the infantry back for 1-2 turns would have allowed me to wear down his blocks with some magic and would also have forced him to engage my units on much more favorable odds more me where he couldn't have engaged my units with more than one of his at a time. I tend to be aggressive by nature when I play and that frequently causes me issues! My idea with the Dragon Mage charging was just to stack the odds as high as I could go. I ordinarily wouldn't want a Sun Dragon in combat with an Abom, or any monster for that regard I think they are much more useful against infantry, but I figured that as many attacks as I could get into the Abom as fast as possible would maximize my chance of killing it before it caused heavy damage. I also agree about the Sword of Battle, I wasn't impressed with it at all. In a slightly modified list I would probably drop the Sword and replace it with the Golden Crown to keep the Mage alive and then add the Banner of Eternal Flame to the Dragon Princes. My having the Prince in the list was not targeted against Skaven, but more generally. I've had experiences in the past where enemy characters, usually a Chaos Lord or Vampire Lord, slaughter their way through half of my army because I didn't have anything that could match them, so I usually bring the Prince to challenge out tough-to-kill characters and kill them. Ordinarily I actually bring Eltharion for that job since his ignore-armor sword and WS8 make him able to kill most characters. In this particular game the prince definitely under-performed since he was just killing Clanrats for pretty much the whole game. I'm not sure about dropping him entirely, though the risk of encountering tough-to-kill characters is much lower when fighting Skaven. His placement in the Phoenix Guard I also generally like for the increased hitting power against a monster or other T5+ model that the Phoenix Guard might have trouble with. Of course in an ideal situation they wouldn't be fighting a monster like that. I do have a mounted prince model on my to-paint list so that is also definitely an option to join in with the Dragon Princes. A very unconventional one. I am currently attempting to only play with painted models, which leaves my options for Lizardmen fairly limited. My opponent has over 10,000 points of painted Skaven, though, so I'm told I'll be facing a very different list! I know this Lizardmen list is definitely not optimized and is not a competitive list. However, I think it should be reasonably fun to play. I've personally never had much luck with the Carnosaur because it dies relatively quickly, but I love the model too much to not field it. The two Oldbloods are virtually unkillable, and my main concern with them would be that they get stuck doing nothing much more than eating Clanrats the entire game, but since I don't know what to expect from my Skaven opponent they could be useful to engage Rat Ogres/Doomwheels/Plague Furnaces. My biggest concern currently is getting surrounded. Any thoughts or suggestions? I probably won't be able to implement any by the time I have to play, but could always use suggestions for the next toys to paint/buy. I don't include it in any of my lists because I've seen too many battle reports where the battle is won by the Banner being on a unit and then that unit carving its way across the battlefield. It's just not something I'm personally a fan of. The problem I've found is that for most HE builds the Banner is almost essential when other books bring anything close to their best stuff. The main exception is of course lists built around 3++ PG, which often bring a Silver Helm bus in addition. I usually bring the Prince to challenge out tough-to-kill characters and kill them. The most successful 3++ list I've seen was the one that won the US Masters one year and that had a foot Prince. I agree that in the absence of mounted characters he's a good idea, for the reasons you give CR. You could choose an Anointed because his innate 4++ lets you bring Giant Blade for S7. But I'm a big fan of Ld 10 and the S6 is of course AP from Razor Standard. If you're going all-in on that unit though, I think you need a solid shooting phase to make the enemy come to you at times because M5 is too restrictive, even with High Magic movement spells. Rod's idea of Prince (and probably BSB) in the DP's might be a good short-term fix because they will then hit much harder and be able to grind too. Very interesting. You'll obviously miss the Slann but the magic defence looks enough and you still have a phase. The Monsters could be great against all that Infantry. I'd be happier with more Skinks but intrigued to see how it goes. That's completely fair. Most games I've seen with the banner used it against opponents fielding fluffy lists or inside of the Alarielle-White Lion-BotWD deathstar. I've also never faced a truly competitive opponent so I haven't run into the really mean stuff. Except one time when I faced a Tzeentch Disk Lord which was interesting. Yeah, the Anointed is another option I've looked into, and I do have 1-2 of them lying around somewhere waiting for paint. The built in 4++ is very nice, making it easy to grab the Giant Blade. The Ld 9 is a negative though, although you can easily add the Crown of Command to him to make the Phoenix Guard unit virtually impossible to shift, but the rest of the army will more easily crumble around him. I also don't like the 3 attacks, it just seems a bit low for a Lord-level CC character to me. I'll definitely look into adding some characters into the DP block for faster hitting power. I've also got a Star Dragon in progress. More skinks are on my painting list as well, I've also got some Terradons sitting around that can perform a similar chaff function and add in war-machine hunting. I think the monster mash will be very effective if my opponent goes heavily Clan Pestilens, but if he goes heavily Skryre it could see many a vaporized dinosaur. My experience has also been that the dual Skink Priest along with the two spell-casting monsters is a quite effective magic phase and having essentially two dispel scrolls offsets the lack of a Lvl 4 by a substantial amount. It should be an interesting game and I'm looking forward to it. Except one time when I faced a Tzeentch Disk Lord which was interesting. How did you deal with him? I also don't like the 3 attacks, it just seems a bit low for a Lord-level CC character to me. ASF helps. Dawnstone plus Enchanted Shield are good to really face stuff down. I've also got a Star Dragon in progress. That's pretty much two magic phases shut down. Eh, not that well. I sent a prince on a moon dragon after him hoping to either tie him down or get some lucky wounds in. The fight lasted a few rounds before my prince and dragon died, no wounds to the Lord. The Lord wasn't really able to rejoin the rest of the game, so that ended up sort of working out, but I lost the game against the rest of the army. 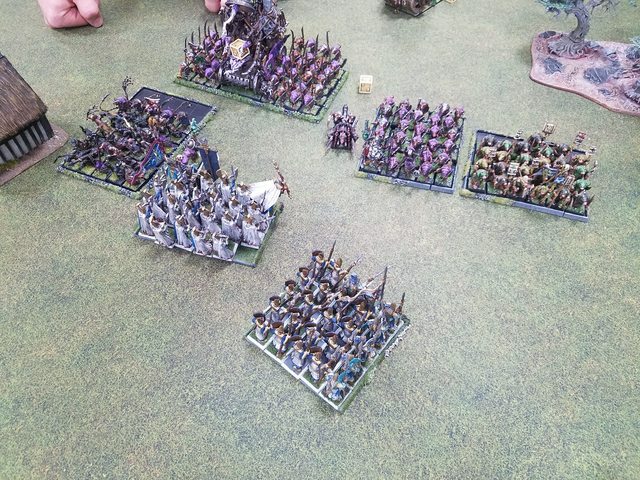 Spearmen and Phoenix Guard didn't do so hot against multiple Gorebeast Chariots with MoN. It was a really early game for me, hadn't played much so I'd handle it differently now. Also just finished my Lizardmen game and will post the report once I get some pictures and the full list from my opponent. In the meantime, and this may give a slight hint as to how some things in the game played out, are there any suggestions as to how to counter a Grey Seer sitting back in a caster bunker spam-casting Cracks Call through the middle of combats? I sent a prince on a moon dragon after him hoping to either tie him down or get some lucky wounds in. The fight lasted a few rounds before my prince and dragon died, no wounds to the Lord. The trick here I believe, is Star Dragon plus Other Trickster's Shard. Again, I suspect too much Infantry and not enough RBT but you've obviously drawn appropriate conclusions CR. are there any suggestions as to how to counter a Grey Seer sitting back in a caster bunker spam-casting Cracks Call through the middle of combats? This would be more of an issue for Lizardmen than elves I believe. It's that tricksy 7th edition Skaven magic isn't it? Maybe something will occur to me as I ponder your report.